Kansai (関西地方 Kansai-chihoo), also known as Kinki (近畿地方 Kinki-chihoo), is a region of Japan located on Honshu island. It consists of seven administrative areas (prefectures), and is home to the cities of Kyoto and Osaka, among others. The exact borders of Kansai and the difference, if any, from the term 'Kinki' is a matter of some controversy. Six prefectures are indisputably within Kansai: Hyogo, Kyoto, Nara, Osaka, Shiga and Wakayama. Mie prefecture is also generally identified as part of Kansai, as are sometimes Fukui and Tokushima. The total population of the Kansai region was 22,754,000 in 2006. The area forms part of an urban corridor running north-eastwards towards Tokyo via the Chubu and Kanto regions; this makes Kansai part of one of the most densely-populated areas of the world, home to over half the country's population. For more information, see: Kyoto prefecture. For more information, see: Kyoto (city). For more information, see: Osaka prefecture. For more information, see: Osaka (city). Osaka is the capital of the prefecture, and a major centre of commerce. It is also known as a gastronomic centre - the 'Kitchen of Japan' (天下の台所 Tenka no Daidokoro) - and for the distinctive local Japanese dialect. 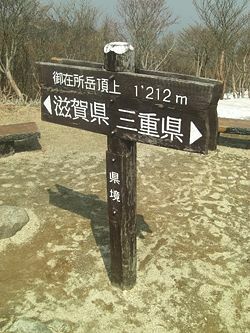 A sign marks one spot where Shiga and Mie prefectures meet, at the summit of Mount Gozaisho (御在所). The area is reached by cable car and ski lift from Yunoyama Onsen station (湯の山温泉駅) in Mie. For more information, see: Mie prefecture. Mie's best-known site is the city of Ise (伊勢市 Ise-shi) and its Shinto (神道 Shintoo) shrines; these are collectively referred to as the 'Ise Shrine' (伊勢神宮 Ise-jinguu) and are considered the centre of Japan's native religion. For more information, see: Shiga prefecture. For more information, see: Nara prefecture. For more information, see: Hyogo prefecture. For more information, see: Wakayama prefecture. Farnie, Douglas A. et al. Region and Strategy in Britain and Japan: Business in Lancashire and Kansai, 1890-1990. (2000). 322 pp. Trewartha, Glenn T. Japan: A Geography (1965). ↑ This article assumes that Kansai comprises seven prefectures, excluding Fukui (in the Chubu region) and Tokushima (on the island of Shikoku). Official Mie prefectural information, however, suggests that Mie is in both Kansai and Chubu (more precisely, the Tokai sub-region of Chubu). 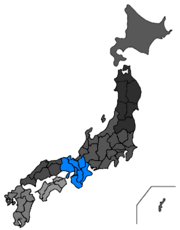 See Mie Prefecture: 'Mie's Location'. ↑ Japan Times: 'Population shrinks again despite increase in births'. 3rd August 2007. This page was last modified 08:47, 29 September 2009.